Windows, and their related products window walls, curtainwalls and skylights are a significant and important aspect of nearly every building. These products are infinitely configurable design elements. 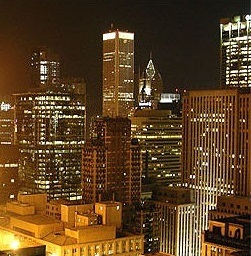 The best windows bring lasting beauty to the building through the use of proportion, texture, color, shadow and light. Windows allow building occupants to connect with the world outside, and afford people on the street a chance to peek inside. Just as eyes have been described as windows into the soul, the best windows are the eyes of the building. We see through them and others gaze into them to learn our true nature. Design professionals who truly grasp the importance of the best windows in buildings will succeed in creating or modifying people-friendly, truly functional buildings. This topic will be expanded upon at length in future articles, but here’s the fundamental. A window can lose twelve times more energy than a wall simply through thermal conductivity, not even including air infiltration. That is a significant drawback worthy of priority attention. It is tempting to blame the odd disconnect of having two sets of parallel measurement systems (U-value vs R-value) on the window industry because it certainly helps to mask the generally poor thermal performance of windows. Such marketing maneuvers are not the reason different product types speak different languages, however, at least not in the way you might think. In actuality, the U-value came first. It had to. U-factor is an actual measurement of thermal conductivity, and started out being physically measured in a guarded hot box, as is described in ASTM C1363. These days it is also modeled and calculated using such tools as THERM software. U-value counts the number of BTUs lost through the tested assembly per square foot, per temperature difference from one side to the other side of the tested material, per hour. Everett Shuman, a researcher at Penn State University, proposed the R-value measure in 1945. Prior to that, the primary measure for insulating value was U-value, which measures heat flow. 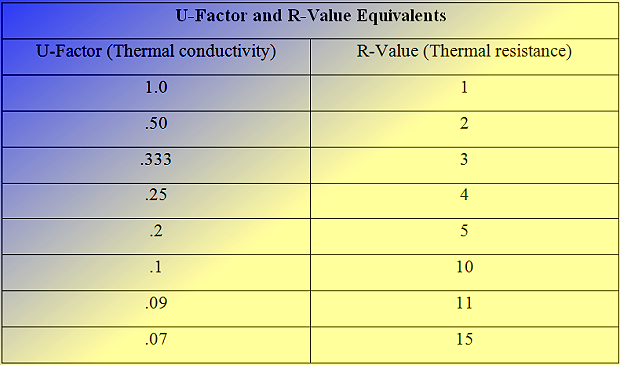 U-value is the inverse of R-value (U = 1/R, and R = 1/U), which measures resistance to heat flow. While “good” insulation has low U-values —an R-13 fiberglass batt has a U-value of 0.08— R-value caught on because people apparently find it easier to understand that higher numbers are “better.” Round numbers also don’t hurt. So the R-Value took root because it was easier for the public to understand, and is further simplified by being rounded to the closest integer. Design professionals who span the globe with their designs must remember that not all U-values are the same, even if they have the same name. Sometimes one must consider the context in order to determine which U-value is being used. Single glazing is little more than a hole that reduces air infiltration in the building envelope. A generic insulated glass unit with no enhancements other than two lites of glass and an airspace, will have a U-value of .47. The thermal improvement is a significant 58% over single thickness glass, but still abysmal compared to 3 ½” of insulation. Unimproved insulated glass loses over 5 times the heat as fiberglass batt insulation in a typical wall. Future articles will show how, through the use of clever strategies, glass in the best windows will approach and even exceed the insulating performance of our insulated wall. There is much more to learn on this subject, but the tip of this iceberg has now been clearly sighted. Here we will begin our exploration of the window as an object that allows light to pass through it. This is a truly unique property. You will not see bricks, concrete or wood conducting light, but windows do. This singular property has huge ramifications for building design. Visible light is small segment of a much larger scale known as the electromagnetic spectrum. This is a spectrum of variations of energy known as electromagnetic radiation. At one end of the spectrum are gamma rays with extremely short wavelengths. At the other end are radio waves, some with wavelengths many miles long. In the middle of this mysterious spectrum is the visible light spectrum sorted by color. From longer wavelength to shorter, the colors are red, orange, yellow, green, blue, indigo, and violet. If you paid attention in 5th grade science, the sequence of colors in the visible spectrum will be quite familiar. Some even used the hard to pronounce acronym ROYGBIV to remember these fundamental colors long enough to take the test. Clear glass readily allows the wavelengths of visible light to pass through it. This is another way of saying glass is transparent. We do not really “see” through glass. Our eyes don’t reach through the glass and capture the image of objects. Instead, the transparency of glass allows light, reflected from outdoor objects, to reach our eyes and be perceived. 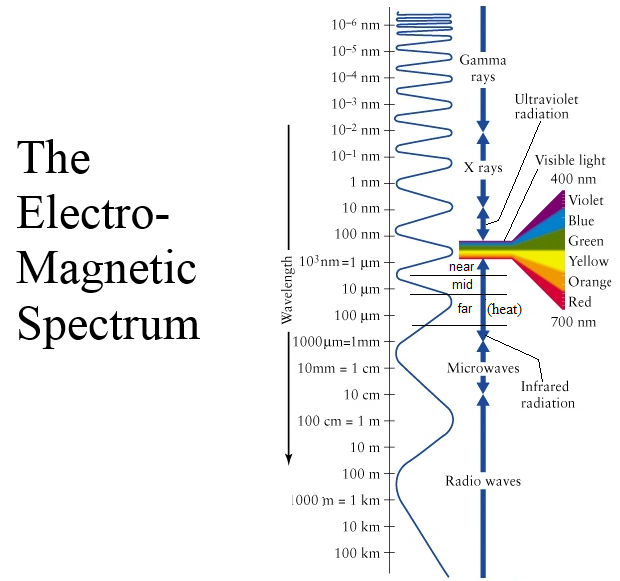 The visible light section of the electromagnetic spectrum is flanked by interesting transitional waves, ultraviolet at one end (next to violet), and infrared at the other (next to red). 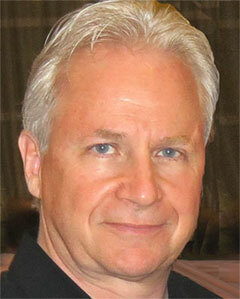 Infrared is of particular interest to the window industry. In addition to the use of this group of wavelengths for communicating between televisions and their remote controls, infrared light is really special because it is the embodiment of none other than heat energy. Thermal heat energy and infrared light is essentially the same thing. This Einsteinian-sounding concept, the convergence of infrared light and heat, allows glass manufacturers to place coatings on the glass that allow only some parts of the spectrum – the visible part – to pass through the glass while the part of the spectrum that is heat is reflected away. Consider the poor office worker whose cubicle has been placed next to a west-facing window. In the afternoon he bakes in the infrared light rays, some that come straight from the sun and some that come reflected from objects. Asphalt parking lots and interior objects that absorb the visible and infrared light will re-radiate all of this energy as infrared heat. We say they “heat up”. Closing the shades doesn’t always seem to help. The infrared light waves have already passed the glass boundary and are freely bouncing around the office heating up the blinds, the space and the workers. Clearly the architect of this building did not anticipate the lack of comfort near the windows. Then winter comes, yet window comfort does not. The same worker now feels permanently chilled because the space next to the windows is cold. The warm air on the ceiling finds the top of the window, where the air becomes progressively cooled as it flows down the face of the glass, wafting along the floor to cool the worker’s feet. This worker will have a difficult time being productive in most seasons. Problems of managing building energy consumption and comfort near the windows are real challenges for architects and engineers alike. to learn all about windows and glass! Alabama, California, Florida, Georgia, Illinois, Indiana, Minnesota, Nebraska, New Jersey, New York, Nova Scotia, Ohio, Oklahoma, Ontario, Texas, Wisconsin. California, New York, New Jersey, Florida.